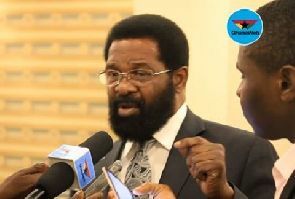 Former Mayor of Accra and Member of Parliament for Ablekuma South Constituency, Alfred Okoe Vanderpuije, has persuaded investors from the United States of America to scout and identify investment opportunities in Ghana. According to Okoe Vanderpuije, he managed to convince the National Black MBA Association (NBMBAA) when he was invited in September 2016 to make a presentation at a conference in the United States on the opportunities available in the Ghanaian market for investment. At a press briefing held at AH Hotel in Accra on Thursday, November 2, Okoe Vanderpuije introduced the investors to the media adding that more than 100 others will be joining them after the delegation is done exploring investment avenues in the country. Jesse Tyson, President National Black MBA Association and leader of the delegation said they will be looking for opportunities in the agriculture, health, IT and manufacturing sectors. The six-member delegation to Ghana will engage the private and government officials in series of meetings to explore investment opportunities between Ghana and USA.